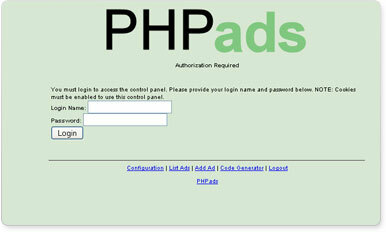 PHPads is a simple php script that allows management of a banner ad rotations. There is an admin panel that allows the admin to add banners, and specify the length of ad campaign. There is also a way for the admin to see single stats outside the admin panel on any banner campaign (good for those wanting to sell banner ads and give their customers something to monitor their campaign's progress.) PHPads creates ad rotation code for admin to place on website. The script is simple to istall and involves no MySQL. Originally, PHPads was PixelledADS in 2005.